Innovation Leadership: Make Innovation Safe & Easy! 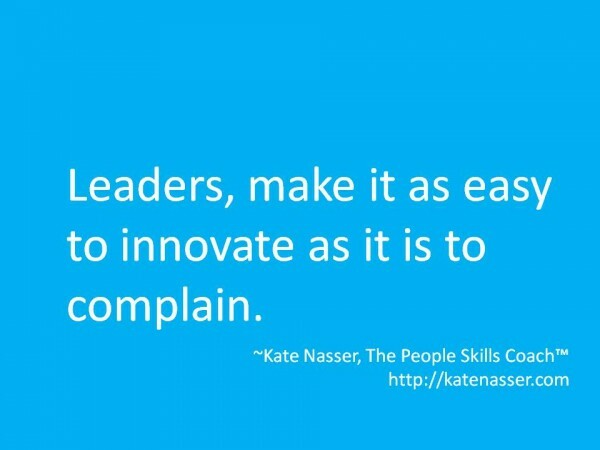 Innovation Leadership: Make it as easy to innovate as to complain. Here’s an innovation leadership checklist to make it easier! Elevate your self-confidence and park your ego. Trust that your position as leader is strengthened when you exhibit innovation leadership — the welcoming of ideas. If you are insecure when others’ talents shine, you will squash the spirit of innovation. Don’t delegate. Empower! To get people to complain less and innovate more, share power. People complain when they feel helpless to change things. Delegation tells them that you are still in power. Empowerment gives them a true voice and accountability for results. Educate them on the true business picture. Un-empowered people see and verbalize what they are feeling. Share the bigger picture. Example: A technical support desk in a hospital system had uninspired employees who complained about the call load, the customers’ attitudes, and the stress. The leader began rotating the tech support analysts out into the hospital and medical offices to see the impact that broken technology has on patients. This transformed the analysts’ attitudes and actions. Make it safe to innovate. Are you a harsh realist that slams ideas that seem odd? If you want people to suggest ideas, welcome the ideas. It doesn’t mean each idea will work. It doesn’t mean each idea will be implemented. Encourage ideas and applaud the courage the employees show in suggestions. True innovators know that innovation is not pretty at the start. The biggest mistake I see in innovation leadership, is lack of empowerment. Leaders delegate and think that will engage employees. It won’t. Delegation is not empowerment. Delegation communicates, stay in line. Check your beliefs. One leadership team realized that they believed employees had to earn the right to innovate and make suggestions. They reached out to top performers, not to everyone. As we worked through their beliefs, they realized that employee engagement is not an award you give to top performers. Employee engagement and empowerment are how you foster top performance. It’s how you get less complaints and more actionable ideas. Empower and engage! What other beliefs make it slyly easier to complain than to innovate? What a wonderful image you are portraying here. I wanted to add that on top of empowerment and sharing the vision, leaders should clear the fog on their vision by training staff with tools that will make such vision visible. Sometimes he vision comes with inherented message that by educating staff will make that unspoken message injected in the culture. You said it Khalid!! Clarity is everything. If people aren’t clear about the mission, goals, etc… what can we expect them to produce?